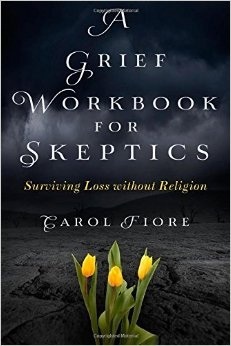 A Grief Workbook for Skeptics by Carol Fiore is just that. If you’re looking for a long and painful essay about loss or a cool and complicated approach to handling grief by a mental health professional, this is not that book. Ms. Fiore’s self-help workbook is appropriate for the recent mourner, someone who has just been confronted with a loss and is in need of basic suggestions on how to get back to life. The author offers a series of tasks to assist you in remembering your loved one, accepting where you are and finding a way to embrace your new different life, without faith. Her tone is friendly, conversational and informal, a gentle voice from one who’s been there. All the basic starter issues are covered here- getting rid of belongings, looking for support, deciding whether or not to move or adopt a pet. She also suggests little writing assignments to help the mourner thinks things through and organize thoughts on paper. When you are devastated and stagnating, having someone give you an assignment can be really helpful. It’s nice to have someone say, “Do this.” Even if you’re not accustomed to taking orders, the grieving version of yourself may be receptive to, and appreciative of this kind of prompt. I know I would have been. I agree with many of the author’s suggestions, including taking time to get out outside and appreciate nature, exercising and volunteering. All of these are great ideas, and frankly, things you might need to be told to do. Just because they seem obvious doesn’t mean you’ll think of them when you’re at your lowest low. While grieving, you may need to be reminded to do things as simple as eating, sleeping or even breathing. You’re sore. Everything hurts. I was hoping for a little more of Carol Fiore’s personal story, because she’s clearly a fascinating individual who’s led a rich life, but I assume I can find that in her other book, Flight Through Fire. But if you’ve just lost someone special, A Grief Workbook for Skeptics is a great place to start. It reads light (which is important, because you may not be ready for heavy when you’re already living heavy) and its plain-spoken tone is comforting and kind. This book feels like an afternoon out for coffee with a loving aunt, someone who will, without judgment or God talk, help give you the tools to keep on keeping on. You can find out more about Carol at her website, http://www.carolfiore.com, and A Grief Workbook for Skeptics can be purchased from Amazon and Barnes and Noble.